The 11th annual congress of the SASVEPM was a resounding success and we thank all the attendees who made it so worthwhile. 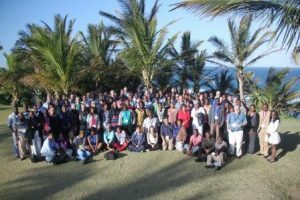 It was one of our biggest congresses to date with in the region of 150 delegates! Our continuing education speakers were superb. Dr Rebone Moerane gave excellent insights into the farm level primary animal health care that can be and is being implemented in rural areas and the impact thereof. Dr Misheck Mulumba spoke on the agricultural trade within SADC and the integration currently in place as well as on PPR’s current status in the SADC region. To download the SADC strategy on the control of PPR please click here. The proceedings of the congress can be downloaded by clicking HERE. This year we introduced the Willie Ungerer Memorial Prize which will take the place of the yearly Epidemiology Prize. This prize is in memory of Dr Willie Ungerer who died suddenly in December 2012. He was a founding and very active member of the society. A floating trophy in the form of a shield was designed and a small trophy will be presented annually for the winner to keep. 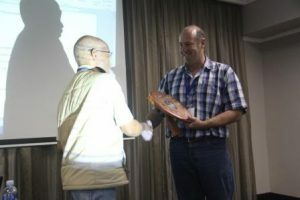 This year the prize was awarded to Mr Kevin Le Roux for his work on Rabies in Kwa-Zulu Natal. Dr Alan Kalake, the new chairperson of SASVEPM hands over the prize in the picture below. The prize for the best presentation went to Dr Lin-Mari de Klerk-Lorist for an excellent talk on the risk of disease transmission associated with the translocation of wildlife. Congratulations to Dr Lesley van Helden and Dr Charles Katsande who have been elected onto the executive committee of the society. Also congratulations to Alan Kalake who is the Chairperson for 2013/14. Please look at the committee’s page for a look at who is involved on the executive.